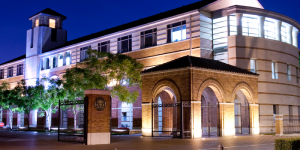 The USC Marshall Executive MBA is a 60-credit program featuring an Integrated/lock-step curriculum with two domestic residentials and no elective coursework. The program can be completed in just 20 months but is generally completed in 22 months. The USC Marshall Executive MBA is located on USC’s historic University Park Campus in Los Angeles and in San Diego at the La Costa Executive Learning Center in Carlsbad, California. Classes in Los Angeles and San Diego meet bi-weekly on Fridays and Saturdays (from 8:50 a.m. to 4:30 p.m.) There is one intake per year, and classes begin during the fall semester. All participants attend an off-site international session that provides an insightful global perspective. The USC Marshall Executive MBA curriculum centers on ten integrated themes that focus in on the types of managerial situations that executives face on a regular basis. For each given theme, class sessions are sequenced to synthesize different functional areas that relate to the overall theme. During the first year, themes covered are as follows: Theme I: Top Management Perspective, Theme II: Evaluating Market Performance, Theme III: The General Manager as Integrator, Theme IV: Operations and Information Systems Management, Theme V: Building Communication Skills. Year two focuses on strategic forms, including: Environmental Analysis: Establishing Competitive Advantage, Dynamics of Global Competition, Strategic Planning for Growth and Profitability, Managing Strategic Change and Implementation, and Executive of the Future. The typical USC Marshall Executive MBA class, Los Angeles Campus, is comprised of 66% male and 34% female, while the San Diego campus typically has 83% male and 17% female students. Students in the Los Angeles class have an average GPA of 3.25, and students in the San Diego class have an average GPA of 3.23. Each class has an average of 15 years of work experience. The average age of matriculating students is 38. Marshall’s year-round learning and networking programs will introduce you to some of the world’s most influential companies. Working with students to identify an industry and career area focus, the school of business offers specialized guidance as students choose courses and pursue a summer internship. The approximate overall cost of the program is $136,000. Costs cover textbooks, classroom materials, parking, university fees, and lodging for the required domestic and international residentials. Airfare and some meal costs during the international residential will be the responsibility of the student. Please note that lodging is not provided or included for regularly scheduled bi-weekly classes. A limited number of merit-based fellowships are awarded to active duty military students at Marshall. These fellowships are based on a range of criteria including scholastic merit, evidence of leadership, work experience and other personal characteristics. Applicants to the USC Marshall Executive MBA program must have a four-year undergraduate degree, or equivalent to apply to Marshall’s EMBA program, applicants must submit a completed application form, all college transcripts from degree-granting and non-degree-granting institutions, a current résumé and two letters of recommendation. Students are expected to have at least eight years of previous work experience but it is not specifically required. The school also requires applicants to complete one essay about their leadership experiences and goals; applicants may also submit an optional essay for any additional information you wish to convey to the Admissions Committee. Applicants must also send in their GMAT scores and a nonrefundable $150 application fee. Applicants are also required to participate in an interview. International applicants may need to submit scores for the TOEFL or IELTS with an application.